When you find the right retirement residence for yourself or your loved ones, it truly is a thing of beauty. A good retirement residence is not just a convenient place to live, it’s an environment in which you can pursue your passions and thrive. Our many All Seniors Care locations strive to provide the ultimate lifestyle solution for seniors with excellent gym resources, pet-friendly policies, healthy and delicious food and a comprehensive health-care oriented approach (rather than business oriented). In this post, we’ll look at several benefits and features of living in an All Seniors Care retirement homes for seniors. Luxury Suites – Residents live in private suites and can take as much time as they need to read, watch TV, and generally recharge in a solo setting. They even have the option to enjoy their meals in their suite if they aren’t feeling social, or if they’re feeling under the weather. This way they can have their cake and eat it too, accessing lots of great shared resources such as live entertainment events, exercise classes and social activities, while still enjoying that valued element of solitude. Age-in-Place – Moving can be traumatic for anyone, regardless of age. For the seniors in your life, the idea of moving out of a beloved house or apartment into a retirement home and then needing to move again when assisted living becomes necessary is a daunting prospect indeed. One of the foundational principles at our centres is aging in place, which means that we offer support for folks at every level of the aging process, whether they require light support, medium support or 24-hour support (in the case of residents with Alzheimer’s and Dementia). When you choose All Seniors Care, you choose a setting that can accommodate your parent(s) through every phase of the aging process. Explore our website to learn more about All Seniors Care Living Centres and our company’s comprehensive philosophy, which hinges on quality care, aging-in-place and supporting activities of daily living. Community Leadership – There are many opportunities for independence and community leadership through resident-led activities such as gardening, baking, dance, choir, morning coffee conversation group, and on and on. Access to Shopping and Nature – ASC residences are all located in close proximity to retail strips, parks and walking paths so that residents can get out and enjoy their environment whenever they please! Daily Activities – Each of our retirement homes across Canada offers a comprehensive activity calendar for both independent and care support residents with events and activities running all year – days, evenings and weekends. Residents have the option to participate in a wide selection of daily physical, social, spiritual and cognitive activities – including live entertainment events, exercise programs such as chair yoga or water aerobics, Wii bowling and the extremely popular pastime of floor curling. Each residence also features a dedicated shuttle bus for outings & medical appointments – wheelchair accessible, of course. Regular Sunday evening country drives are a favourite among our residents! Group Activities and Socials – Collaborative opportunities such as gardening, woodworking, baking and arts-and-crafts are also available, giving residents more independence and freedom to engage in the activities they enjoy. 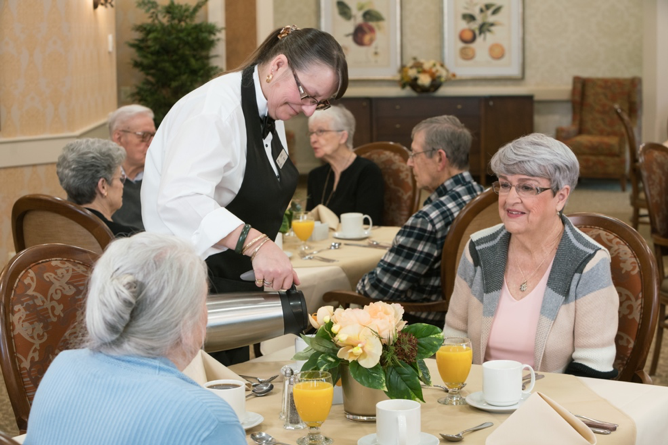 Festive, residence-wide events are organized every few months at each All Seniors Care location across the country, complete with a special menu, recreational activities and decorations. The recent western-themed Canada Day buffet BBQ and Lumberjack games was a huge success with many resident’s children and grandchildren joining in the fun. We encourage our residents to live energetic, full, independent lives and also to dance, exercise and laugh together at every opportunity – take a minute to check out this video of a group dance class at our Preston Park 2 location in Saskatoon! These kinds of shared experiences have tremendous value for health and wellbeing. Caring and Friendly Staff – Our caring nurses, support workers and friendly community volunteers are brought in on a basis of personality in addition to training and experience. This means that they are open-hearted folks with excellent social skills who are interested in learning about people. From our red-seal certified chefs to our fitness instructors, nurses and doctors, everyone is dedicated to fostering an environment where people can feel comfortable being themselves, goofing off and sharing valuable wisdom and life experiences. Peace of Mind – The peace of mind that comes with the ability to age-in-place amongst friendly peers and professionals means that residents can feel secure in their health and independence, allowing them to blossom in their old age. Life at All Seniors Care means the beginning of a new, exciting chapter. Carefree Living – No more dirty dishes, no more shovelling snow, no more house-keeping – you don’t even have to make your bed if you don’t want to! We will take care of everything to ensure you live peacefully and at ease, no matter what. Your loved ones can sleep well knowing you are safely cared for in a sound environment. At our centres, you’ll be free to pursue what is important to you without sweating the small stuff. This kind of freedom will definitely allow you to maximize your days and live life to the fullest! The benefits of living in a community retirement home are obvious. In keeping with the All Seniors Care Living Centres’ philosophy – Caring is Our Number One Concern – we take pride in ensuring the highest level of care is offered to our residents. Please visit the All Seniors Care Facebook page or search for a specific location on Facebook to find an individual residence’s Facebook page and see regular photos from all the daily activities and events. You can also check out our latest news for more info on community events as you continue your search for the optimal living situation for yourself or a family member!